You just stepped out to grab lunch at your favorite downtown spot. Instead of reaching for a can of soda as you slowly approach the cashier, you lean in to pick up that fizzy, refreshing, bubbly soda water. You pop open the can walking back to your office only to notice that everyone in town seems to be carrying a bottle of sparkling water. Sipping a soda water is now as common as enjoying a cup of fresh brewed Starbucks coffee. Corporate offices are stocking up their employee fridges and companies like Bevi are making a killing to ensure an easier refill of your fizzy water with the tap of a touch screen. Perhaps it’s the bubbles that make this type of water so fun to drink. But did you know that before the flavored bubbles, carbonated water was first introduced in pharmacies as medicine when it was invented back in 1767? It wasn’t until the 1900’s that carbonated water started to take the shape of cola, flavors and sugary drinks. Our bodies are composed of roughly 60 percent water, and we need to replenish daily with the doctor’s recommendations of eight cups of water per day. Especially if we’re hitting our favorite yoga class to sweat the stress away. The fizzing question is, are there any other health effects we should watch out for? Keep reading to find out 3 facts you should know about your new crush on soda water and how it’s really affecting your body. First, let’s talk about the different types of soda water. Seltzer Water: Seltzer water has been artificially produced by passing pressurized carbon dioxide to water without added ingredients or flavoring. 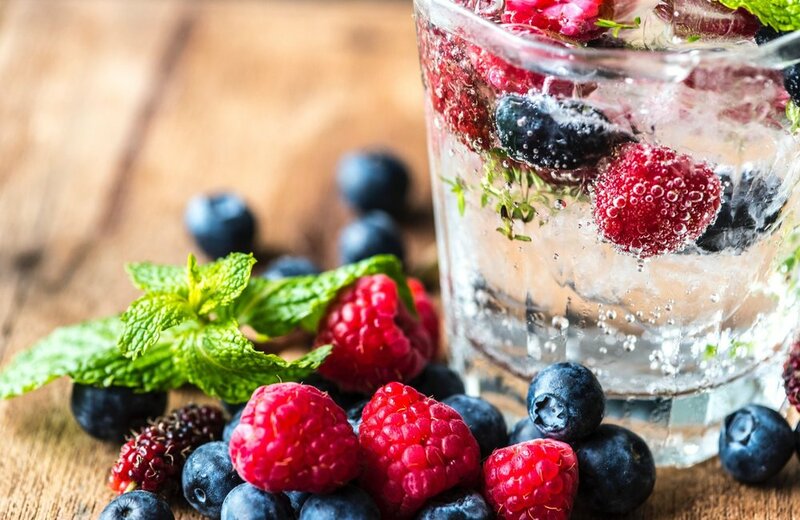 You may notice that some seltzer water have “flavors” - as long as the drinks are flavored naturally, without dyes, or additives they are considered seltzer water. La Croix falls under seltzer water category. Club Soda: Similar, club soda has been artificially produced by passing pressurized carbon dioxide but the difference is club soda does have two added ingredients. Club soda contains potassium bicarbonate and potassium sulfate, which give it a slightly saltier taste. For this distinct taste, bartenders tend to favor this version for mixed drinks. On average, club soda has between 50 to 65 milligrams of sodium per 8-ounce serving. Any food or beverage that contains less than 120 milligrams of sodium per serving is considered low in sodium (according to the American Dietetic Association). Therefore, even though it’s low in sodium, it still contains salt so beware of how many servings you consume. Mineral Water: Mineral water is naturally occurring carbonation and minerals. It’s bottled directly from the natural source. Think Perrier and San Pellegrino- these tend to be pricier because they are naturally occurring and some describe it as a more delicate bubble. Can you taste them on the tip of your tongue now? Second we’ll answer the most common question, is soda water bad for your teeth? One of the main concerns sparkling water aficionados have is, does drinking this fancy water impact my teeth? While research is limited as the fad grows, one study found that sparkling mineral water damaged enamel only slightly more than still water. Scientist explored the pH level and total acidity of a range of beverages to determine the capacity for dental erosion. The study concluded that beverages with more sugar had the strongest potential for enamel erosion, damaging your teeth. Ranking popular beverages in the following order from highest erosion of enamel to lowest: energy drink, sports drink, regular carbonated cola or soda, diet soda, blended coffee drink, and lastly still water. With that said, while you’re enjoying your fifth, sixth, or maybe even tenth bubble water of the day, be sure that it’s naturally flavored. Read the label on the back. Confirm no sugar has been added and review the small print! Companies sometimes label their drinks as “sparkling juice” which is not the same. Labels like this most likely have sugar added, even if it’s cane sugar. Finally, we’ll uncover how fizzy water affects your digestion. Researchers conducted a double-blinded study comparing the effect of carbonated water versus tap water in people who suffered from various gut health problems such as indigestion and constipation. At the end of the two week study, those drinking mineral water (a type of fizzy water) reported that their gut problems improved. It is no surprise that soda sales have been steadily decreasing for the past 12 years as consumers are more aware of the health drawbacks. Luckily, most soda water contains zero grams of sugar. Be label conscious and avoid more than a handful of servings of club soda. Know that you are staying hydrated, hopefully decreasing your intake of less healthy beverages, and potentially aiding your digestion. So don’t be hesitant to reach for that fourth bottle of bubble water rest assured that your body is benefitting in various ways from your healthy addiction. Cheers to enjoying your soda water in a healthy manner! Please note we are not medical doctors, scientific researchers, or licensed therapists. We always recommend you speak with your doctor for situations specific to your individual health.